The first quarter of the year is nearly over and due to seasonal influences, we've likely seen 20% of this year's home sales already closed. 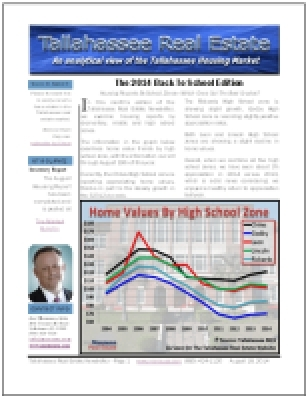 We often have people asking us "how is the market," so today's report shows the current state of the Tallahassee housing market in terms of home prices, home values, and home sizes. 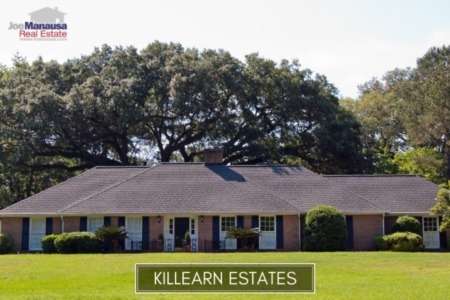 Before we hit the report, take a look at the newest listings of homes for sale in Tallahassee. The report continues after the listings. Today's housing update will include 3 graphs. Each one will evaluate the middle of the market (median) as it gives us a perspective of the direction of market movement. Each of our graphs will segment single-family detached homes, townhouses, and condominiums. The first quarter of home sales in Tallahassee has brought us increasing median prices in all home types. There are several interesting trends that we see in the graphic above. First is the apparent meandering condominium price trend (dashed line). You might wonder why it fluctuates so greatly and so often. There are two primary reasons for this: Low-liquidity and the downtown market. There are relatively few condominium sales in Tallahassee when compared to townhouse sales and single-family detached home sales, and the downtown market is significantly different in price when compared to all other Tallahassee condominiums. Thus when the downtown market represents a great percentage of condo sales, then we see the median shoot higher. Conversely, when the downtown market is quiet, the median price plummets. Currently, the downtown market is quiet. Another interesting trend can be seen among single-family detached homes (red line). Unlike condominiums and townhomes, the median price of detached homes has posted a new all-time high. This suggests that people are paying more for homes than ever before. The median home value in Tallahassee is measured as the middle price per square foot of all homes sold in Tallahassee each year. Look at how closely all three property types were valued from 2003 through 2008, then look at how they have segmented since that time. The difference between detached homes (red line) and the attached homes (blue and dash light blue) remains significantly further apart than they were before the market peaked in 2003 through 2006. Right now, primarily due to low mortgage interest rates and depressed home prices from the crash of the market, buyers have favored single-family detached homes in the price ranges where both are available. As prices continue higher, it will exclude many buyers who will be forced into the attached-home market. Because of this, expect attached homes to increase at faster rates than detached homes for the foreseeable future. The influence of the downtown market explains the noise in the condominium sales data, but it does not explain the recent decline in condo values. I suspect that with the glut of condominiums in the downtown market has created this noise and will continue to do so until the market reaches equilibrium with condo inventories. If you are in the market for a smaller home or one on a smaller parcel of land, don't ignore the possible deals you might find among the townhomes for sale. 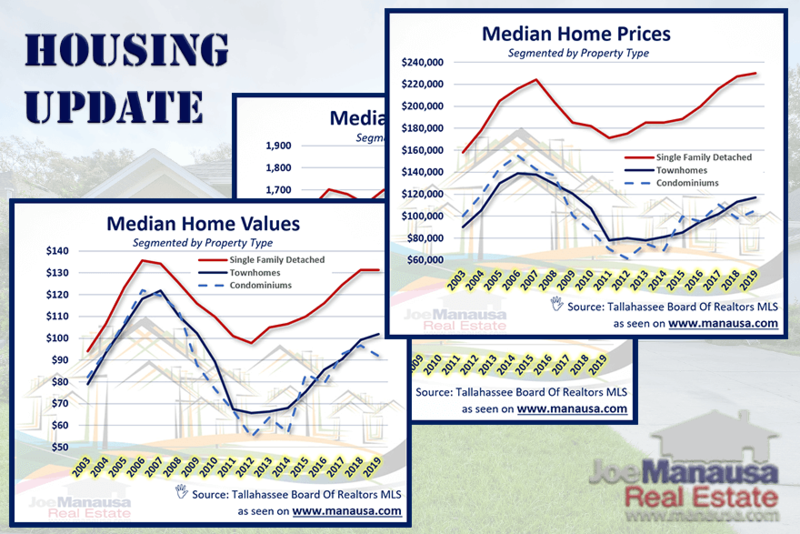 The median home size in Tallahassee is important to track because it often explains the unparalleled movements of prices and values. In the future, down at the neighborhood level, median and average home sizes will alert us to neighborhoods that are transforming through renovations and modernizations. As expected this graph helps explain the two previous ones. For example, the median condo size this year has shot up 5%, while condo values have declined by 5%. As a general rule, smaller units will sell at higher prices per square foot due to the fact that the more expensive components of each condo end up being divided by fewer square feet. For example, an expensive kitchen in a small condo unit impacts the overall price per square foot far more than the same kitchen would in a larger unit. The following table shows the most recent 1,000 homes sold. You can sort the table by any column header if you desire to do so. 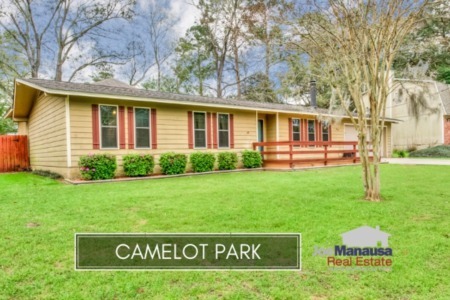 This concludes our March 2019 housing update by property type, please give us a call at (850) 366-8917 or drop us a note if you have questions about this great place to live in NW Tallahassee. Planning a move in 2019? Why not put the best team to work for you and your family? Here's what people are saying about working with Joe Manausa Real Estate, you can see thousands of real customer reviews reported on Google, Facebook and Zillow right here: http://www.manausa.com/testimonials.